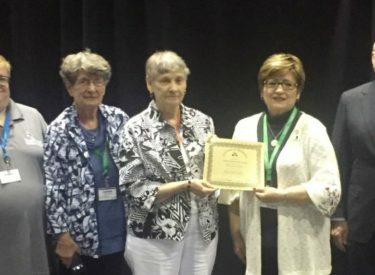 The Southwest Medical Center Auxiliary volunteer team received the Hospital Auxiliaries of Kansas’s Gold Award for 2018 at the Kansas Hospital Association convention this month. The Gold Award is the highest level in the Award of Excellence category, and is provided to auxiliary groups who go above and beyond to promote community health and assist the hospitals they serve. HAK member auxiliaries have more than 7,500 members across 59 participating auxiliary groups in Kansas. Southwest Medical Center’s Auxiliary volunteers are always seeking new members of all ages to serve the Liberal community. Annual membership dues of $10 a year are applied towards local medical scholarships, and members can participate in service activities that support patient care. If you are interested in becoming a member of the SWMC Auxiliary, please contact the SWMC Auxiliary Gift Shop at (620) 629-6899. Photo (Gold Award) – (left to right) Southwest Medical Center Chief Financial Officer, Amber Williams, joins SWMC Auxiliary members Connie Richmeier and Katie Berg in accepting the Gold Award from Hospital Auxiliaries of Kansas Immediate Past President, Diana Holloway, and Tom Bell, President of the Kansas Hospital Association, during the annual Kansas Hospital Association Convention earlier this month. Photo (President Staiger) – Linda Staiger delivers remarks during the annual Hospital Auxiliaries of Kansas luncheon hosted during the Kansas Hospital Association Convention. Staiger is a Liberal resident and currently serves as President of the Hospital Auxiliaries of Kansas.